Many websites provide an RSS feed allowing people to subscribe to it. An External RSS Feed object displays such a feed as part of your site. 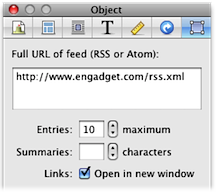 This can be added by selecting "External RSS Feed" from the Objects toolbar item. Visitors can click on an item in the feed to read the full article. Note: Although you can drag the URL of the RSS feed from a web browser or another application to the Site Navigator, doing so will not create an RSS Feed; rather it will create an External Page, and you will not have the same ability to control the way the RSS Feed appears on your site. So although this is a possible way to incorporate an RSS Feed, it's not generally recommended. Open the Object Inspector. Here you can edit settings specific to the RSS feed as shown below. The full URL of the RSS feed. For information on how to find the URL of a feed, please see the "RSS" article. Limits the number of items displayed in the object. If you're incorporating a busy feed and don't want it to take up a lot of space in your site, set a limit here to control how long the object will be. If you enter "0" there will be no limit. Entering a number here will add summaries under each headline, up to the number of characters specified. Leaving this field blank or entering a 0 will eliminate the summaries. 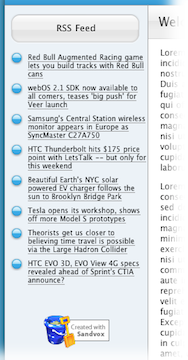 Checking this box will open a new browser window for each link in the RSS feed. RSS Feed objects use Karelia Services to handle RSS feeds. The server takes a feed and transforms it into HTML code that is displayed on your site. Karelia uses MagpieRSS to power this service. To ease the load on the sites whose RSS feed is to be displayed, each RSS feed is cached and updated once an hour.